We view this deal positively as it has acquired a high-quality asset at a discount to the valuations of comparable properties and the replacement cost of a new office building in the vicinity. It will fund this acquisition with a SGD690m rights issue, SGD1.12b of debt and SDG340m of divestment proceeds. Post-acquisition aggregate leverage remains comfortable at 37.1% (from 36%). We keep estimates unchanged pending deal completion. Maintain BUY and SGD1.81 TP (target yield of 5.0%). 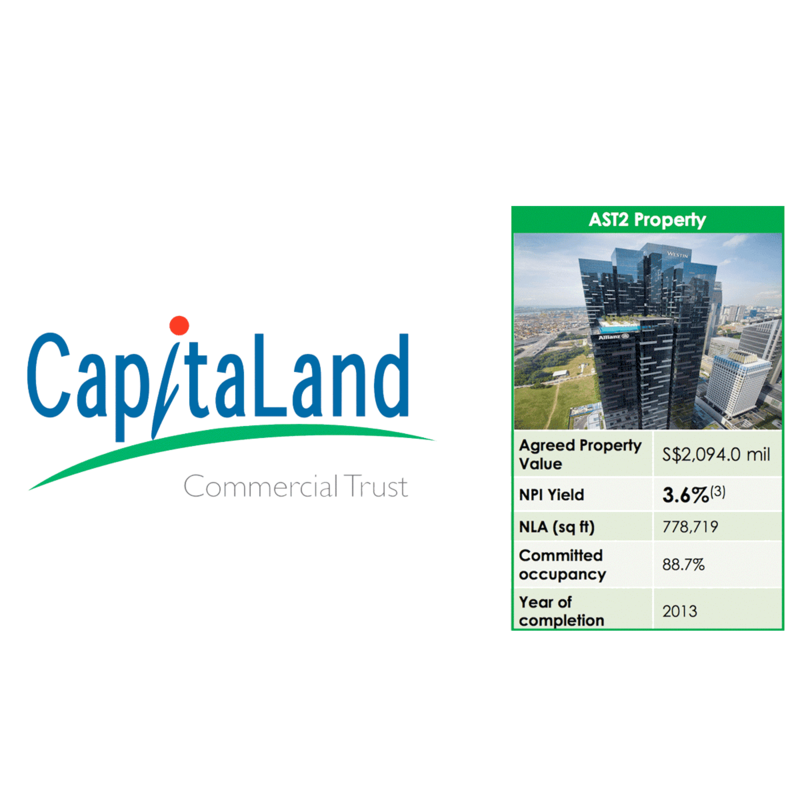 CapitaLand Commercial Trust (CCT) is acquiring Asia Square Tower 2 (AST2) for SGD2,094m or SGD2,689 psf NLA. The premium Grade A office building has 753.4k sf of office and 25.3k sf of retail space. The property has a committed occupancy of 88.7%, which translates into a decent NPI yield of 3.6%. We think this is a good entry price as the unit price of SGD2,689 psf is lower than the valuations of comparable properties in the vicinity and our estimated replacement cost as implied by the Central Boulevard land tender last year. Furthermore, we see upside to its entry yield as occupancy should improve from the current 88.7% with active asset management. With this deal, CapitaLand Commercial Trust (CCT) has effectively swapped out a 50%-stake in One George Street and Wilkie Edge at 3.2% and 3.4% yields, respectively, for a higher quality asset at a more attractive yield of 3.6%. One negative aspect of this deal, however, is the inherent tax leakage of the holding structure established by the vendor. Assuming a similar tax leakage of SGD3.2m as in 2016, we estimate an effective post-tax yield of 3.4% for this deal. Secondly, the property could experience negative rental reversions in the near term as the passing rents are relatively high. We estimate blended passing rents of about SGD12 psf. 1H17 pro-forma disclosures showed a slight yield dilution with actual DPU yield falling from 5.38% to 5.13% (at its TERP of SGD1.648). However, we are not concerned as the committed occupancy at AST2 is higher than in 1H17 and we see further upside through active asset management. Successful redevelopment of assets such as Golden Shoe Carpark.